- Every person have desire for rewarding career which brings them most satisfaction. When I will get a new job Is the overseas job good for me Is it good time to change job What will be my earning potential These types of questions come to job seeker's mind. Our astrologers will carry out a micro-analysis of your Personal Horoscope to bring you practical and relevant solutions that will help you solve your problems. So, you get the success you deserve! The 6th house in one's birth chart is associated with the job. We look at what kind of job combination one is born with; success and fame one will get through a job. 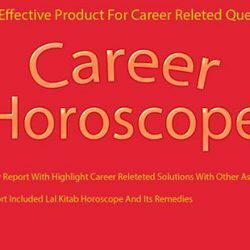 We also can advise on, professional vs nonprofessional jobs, government vs non-government jobs, what kind of professional jobs will bring economic growth, which companies will be more beneficial, risk if there are any ..
Do you have a question in your mind that you just can't stop thinking about Getting an astrological perspective will certainly help you in making an informed decision. Coupled with remedies and guidance, it is a definitive answer to your queries. Siddhivinayak Astrology Services Pvt. Ltd.